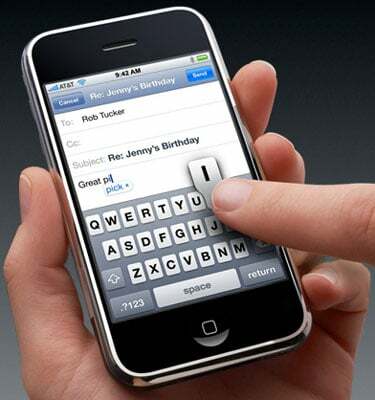 A Florida-based company has accused Apple of infringing a patent it owns for a readable keyboard display, similar to the iPhone's touch-screen. SP Technologies filed a claim alleging that Apple has infringed on a patent it was granted in 2004 for a "method and medium for computer readable keyboard display incapable of user termination". The suit was filed at a federal court in Tyler, Texas, which last week witnessed a patent infringement filing over Sony's Cell CPU, and which is often seen as sympathetic to claimants in patent infringement cases. SP Technologies is seeking "reasonable royalties" from Apple, which online rumours have speculated could see compensation paid for each iPhone already sold. The claimant is also seeking a permanent injunction against Apple's use of the patent in its hardware. If found guilty of wilful and deliberate infringement, Apple could be forced to pay punitive damages equal to three times the economic loss suffered by SP Technologies as a result. Apple was was unavailable for comment. However, its legal department certainly been busy this year. The company has already been sued by Cisco over the use of the name iPhone, and was last month sued by Eminem's music publisher in a multi-million-dollar lawsuit surrounding downloads of the rapper's songs via iTunes.